Note: After CyberMonday, you can continue to count on this BuyVia App to help you save money at all leading stores throughout the Holidays! Walmart Cyber Monday 2017 Sale - New items Added starts November 27, 2017 at 12:01am ET - Quantities are limited and will sell out fast. Free Shipping $35+ online. Many items were on sale for Black Friday, but sold out fast. 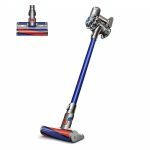 Dyson DC59 Vacuum $189 Free Shipping (reg. $369.99). In store: Dyson DC34 Bagless Cordeless Vacuum $65 Free Shipping (reg. $169). Out of stock: Instant Pot 5-qt Pressure Cooker $49 Free Shipping (reg. $69.99).